"Come Closer" is the name of a small magazine which was published in the 1990's to promote understanding, respect, and love between Catholics and Muslims in Africa. I found a number of copies of these booklets among my dad's papers. Dad had ordered them directly from Kenya. The priest who started this publication was Fr. Francis Baldacchino. Originally from Malta, Fr. Baldacchino became a missionary in Kenya, learned Swahili, and eventually was named as the first Bishop of the Diocese of Malindi, also in Kenya. He served as Bishop until his death in 2009. From everything I've read about him, he truly carried the work of Christ in his heart and in his hands. 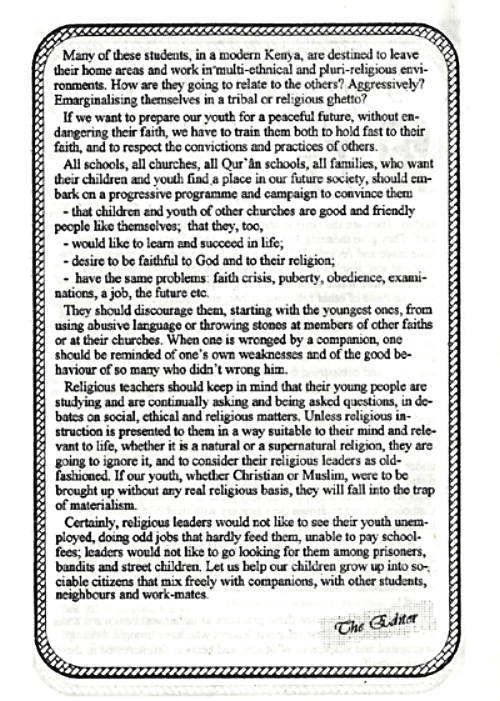 I contacted the Pastoral Centre in Garissa, Kenya to ask if I could share some of these articles. Br. John wrote back giving me this permission and asking only one favour. Would I scan the letters my dad received from Fr. Francis and send them to him? They will go into the records in Malta. Thank you Brother John. Here is a letter he wrote to my father in 1992. Three days ago, our current administration created even more bans on immigration and travel to the US from countries which are predominately Muslim. This administration is creating a climate of fear and antagonism. Fr. Francis' little magazine was written for people in Africa. Maintaining good relationships with their Muslim neighbors was and is important. Other pages in the magazines educate us about the customs and beliefs of Islam. There are side by side quotes from the Bible and the Quran or from a Catholic mystic and a Sufi mystic. We are much more alike than we think we are, but so many people are insistent on looking at the differences. There are extremists in both Islam and Christianity, but the majority of Christians and Muslims are ordinary people who want a peaceful future for their children. What is also so meaningful to me is how important this was to my dad. We brought a copy of one of the magazines to him tonight. He remembered them vaguely, but maybe another day something will come to mind and I'll find out more of his story. How did he find these? What prompted him to write to Fr. Baldacchino and order the entire set?